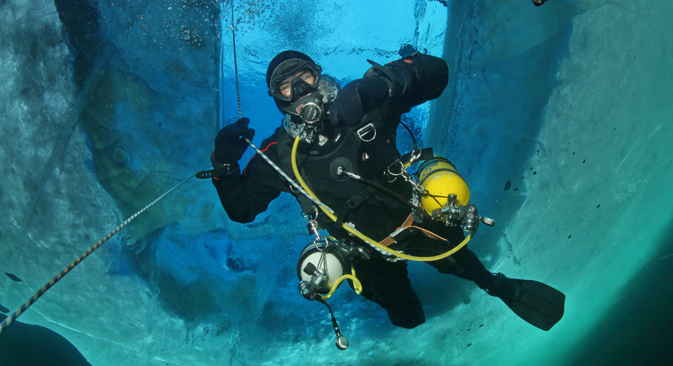 Russian scuba divers are aiming to set a new deep-sea record in the Arctic Circle. The expedition marks the beginning of “The Seas of Russia,” a project that will involve deep-water dives in all seas surrounding Russia, test new equipment and study local marine life. A group of scuba divers from the Russian city of Kazan (500 miles east of Moscow) are planning to perform a deep-water dive of over 100 meters in the Barents Sea in northwest Russia. It promises to be the deepest plunge ever north of the Arctic Circle. The divers’ mission will involve testing new breathing equipment produced in Russia, examining the impact of deep water on the human body and collecting data on local marine organisms. The water temperature on site is approximately 0°C (32° F). Among those joining the expedition will be Božana Ostojić, a member of the World Underwater Federation Council and a former associate of the late groundbreaking French explorer Jacques Cousteau. Ostojić has been tasked with officially confirming the international record. The new underwater equipment to be tested by the divers was developed by the Russian holding company Termodinamika, a subsidiary of the Rostec state corporation. It can be used at temperatures as low as -4°C (24.8°F). The equipment was previously tested at a lab at depths up to 300 meters with a water temperature of about -2°C (28.4°F), and on the surface with air temperatures of -19.5°C (-3.1°F). Now it must be tested in a natural environment to detect and eliminate possible defects. The crew consists of experienced divers that have already explored the coldest waters of Earth, including those of Antarctica. “Cold water diving involves additional risks like temperature, unexpected currents, darkness in deep water, large animals, as well as the lack of necessary data,” says Alexander Gubin, an expedition member. During the plunge, the divers will collect data on the species inhabiting coastal waters. No scientists examining the site have previously gone deeper than 20 meters. Previously in order to gather data, researchers preferred other methods, such as using boats with special nets to collect benthic organisms, small animals and plants living on the seabed. However, scuba divers can gather more accurate data on local sea life. Yet another task is examining the physiological conditions of scuba divers in extreme depths. The high pressure of deep-water environments puts a strain on even the most experienced scuba divers. There is also the risk of so-called “nitrogen narcosis,” an alteration in behavior caused by various gases when diving at great depths, which usually manifests itself as panic or euphoria. Collecting scientific data will be one of the tests to assess the divers’ psychological state and perception. Apart from the research, the divers are also planning to install a memorial sign honoring dead sailors on the bottom of the Barents Sea. There is a spiritual idea behind the expedition as well. The divers will bring two relics: these will be the icon of Our Lady of Kazan, revered by the Russian Orthodox Church, and a Surah (chapter) of the Qur’an, Islam’s holy book. The two artifacts will serve as talismans of the expedition. Additionally, the expedition divers have been appointed as the ambassadors of the World Aquatics Championships, which will be held in Kazan in 2015. They have been given a capsule filled with water that had previously been in space. The capsule will be brought to the bottom of the Barents Sea, and later will be used during the opening ceremony of the Championships. The record-setting dive will commence a new project called “The Seas of Russia.” The divers’ goal is to set new records in all the seas surrounding the country. The project team will also film a series of documentaries and publish notes for researchers. “We will be working without any support from the mainland,” says expedition leader Dmitry Shiller. If the Barents Sea dive is successful, the divers will attempt to set a record in the adjacent White Sea in 2016.